Sometimes the simplest things are the best and nothing could be simpler or more appealing at the dinner table than these melamine Snack sets from notNeutral. 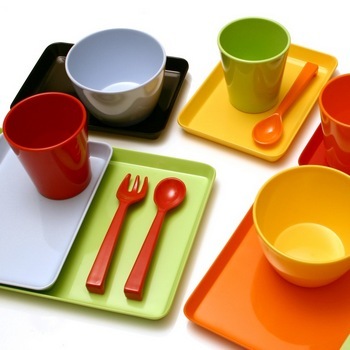 Each six-piece set comes with two trays that double as plates, a cup, a bowl, a fork and a spoon. They look so neat! Is it just me or do they remind you of the compact little trays you get on a plane (minus marginal aeroplane food)? There are three colour options – orange/ yellow, black/red and blue/green. 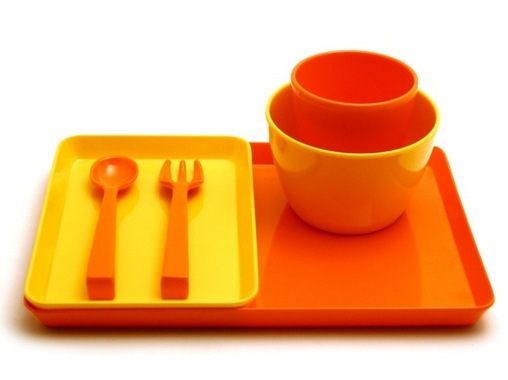 The black/red set obviously lends itself to a first sushi dinner but the retro orange and yellow is my favourite. The Snack sets, US$32, coordinate with notNeutral Duplex placemats to complete the look. They are BPA-free and dishwasher safe. Get them at Spunky Sprout, which ships to Australia.